We just wanted to give you a quick heads up on the updates we’ve made to simpleERB over the past few days. We’ve already brought in offers and we’re working towards a few more things to complement this feature. 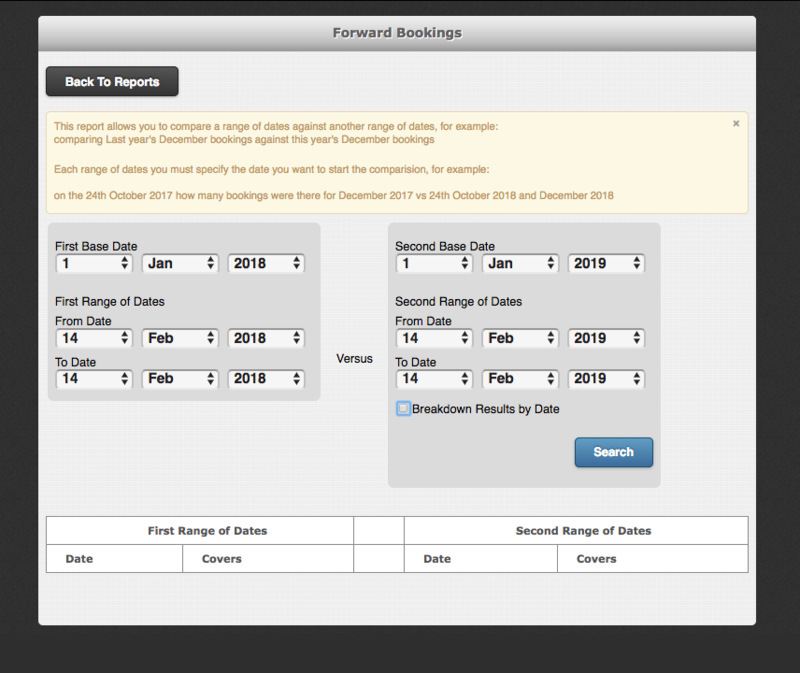 Inside the main site, we’ve made some improvements to the bookings detail page. You can now find customers and auto fill their details based on phone number and email, not just name. It was getting too hard sifting through all the ‘Smiths’! In reports you can now export customers based on which offer they have booked and in the reviews report, you can download your reviews as a .csv file. There’s also a ‘disappearing customers’ report that allows you to set a reminder to check the report to see which of your regulars may have stopped visiting your restaurant. Pairing disappearing customers up with offers could allow you to entice them back with a special deal. It also keeps you in contact with your clientele. We also launched our help centre which over time will give you help, hints and tips on how to get the most out of your simpleERB account. We’ve added a few things under the hood to improve your experience and squashed some bugs that popped up. More big things are coming and it’s down to our users that we are developing the things we are. We’ve spoken to a lot of you over the last few months and it’s really given us an understanding into the challenges which restaurants face as well as seeing how differently every restaurant is run! Thanks again for your support and remember, if you’ve got any queries, feedback or suggestions, get in touch! Help is now at hand with our newly launched simpleERB help centre. Now, don’t get us wrong, we love talking to you and sending you emails. And who doesn’t love getting mail? That said, we bet that every time you need a bit of help on simpleERB, you wish that you didn’t have to find the time to compose and send us an email. That’s why we’ve started collecting a bunch of useful tips as well as questions we find we get asked often, and created the simpleERB help centre. Having the answers to questions at your fingertips will help you get things done quicker. No longer will you have to refresh your mailbox waiting for our reply! You may also have noticed some tips popping up in simpleERB. We realise that the product is growing and you might have missed some features, so just look on these messages as a friendly nudge to something we think will make your life easier and restaurant run more efficiently. Like we said, we do still love getting old fashioned email, so please still drop us a message with any questions that you might have. It will make us feel loved! Are you remembering to tag your customers? Do you tag customers on simpleERB? Tagging customers can help with many things such as informing your staff about a customer or booking specific information so that they know exactly which page they are on when they walk through your front door. Setting customer tags is also good for your marketing campaigns. It means you can target specific subsets of customers and you can send them info which is relevant and interesting to them. We hear you cry, but how do I set up customer tags? It’s easy, and you see them every time you add a booking. The quick info buttons on the booking page are what we use to tag customers. We’ve preset some ideas for you but you can change these to anything that you want. In your advanced settings, under general, there is a tab called ‘booking information options’. You can add, delete and reorder your ‘tabs’ from here. They will then appear on the booking information screen every time you enter a booking. We mentioned two of the ways you can benefit from tagging your customers. The most obvious and up front way is that when the diner visits your restaurant, a quick glance at your diary will show any of the tags that you’ve added so your waitstaff know straightaway that the customer is a VIP or a vegan and they can treat them accordingly. We also mention using tags to target specific groups with mailing campaigns. Although we don’t have an ‘in-app’ mail marketing solution, there are many other dedicated services like MailChimp who do it better than we ever could. simpleERB does always allow you to download your customer data at any time so if you use tags, you can download certain samples of your database to target specific customer sets. For example, you might want to tag all customers who use a discount voucher, or book via a different website. You might want to contact them and offer them the same offer that they booked but this time directly through yourself. You could even integrate this with our new offers system and send them all a unique URL to an offer that is just for them. All you need to do is select the relevant info buttons when exporting your database. Log in to simpleERB now and know your customers better! Messages for customers is one of our new features which we’ve added on the back of some feedback from users. Many of our users wanted to be able to convey specific information to customers depending on when they have booked. Those of you who are familiar with our messages for staff feature, will know exactly how this new feature works. 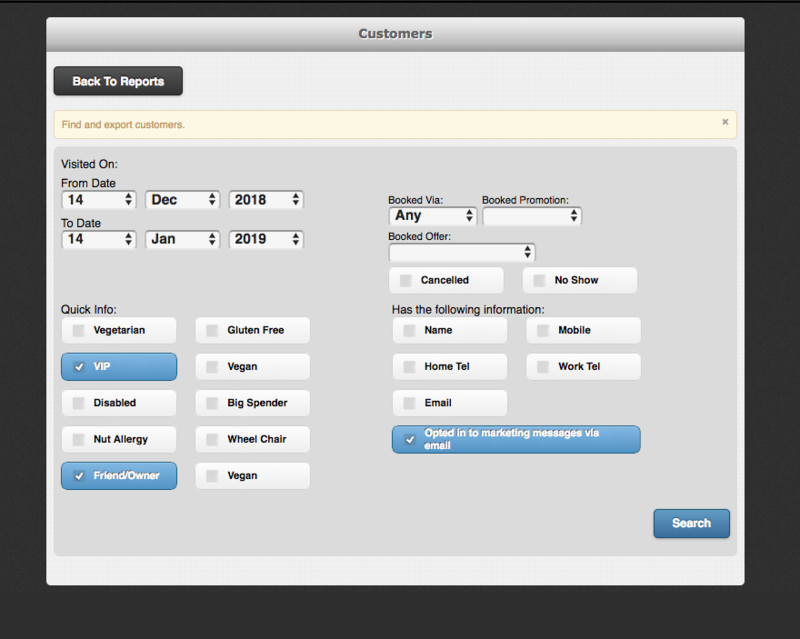 Like staff messages, messages for customers allows you to pre-set messages for the benefit of your customers who are booking online. You choose a set of dates and a time when you want the info to be available and when a customer visits you website and tries to make a booking, the info will appear once the customer has selected the time they wish to book . A few customers have asked if we are going to allow messages for customers appear on the very front page of the widget rather than being dependant on a date, day or time. We might, but in the meantime, the best thing to do would be to use some of the space around your web widget on your own website, to add your own text. For example, this is how Spitfire Barbecue in Bristol do it. Of course, you could use the messages for customers feature to tie in with your offers, which you can now also add for booking on your simpleERB widget. We’ve recently added the ability to take deposits through simpleERB and many of our users have already taken the ball and run with it. One of the great things we find, is that our users all have different ways of using the system. We’ve seen that taking deposits is no different. In basic terms, we set deposits up so that restaurants could take deposits or card details for bookings at certain times. Whether the deposit was being taken on specific days or in a certain time period, for example Christmas, it was a simple process. Of course, along then came our users who made us think of different ways in which they might want to use the deposits system. We already have offers in the pipeline (shhhh, it’s still under wraps!) but our users have asked now that we’re doing deposits, can they sell ‘tickets’ or take full payment in advance. We’ll have an elegant solution for this in the future, but for now, it’s still something which can be done. You might be running a charity dinner or your restaurant may only offer a set menu and for this reason, you’d maybe want people to pay in advance. Say, for example, that on a Saturday night you are always booked up weeks in advance, especially at 8pm, you can tailor the deposit settings within simpleERB to take a payment for bookings only at that time. Easily! Once you’ve configured your simpleERB account to your Stripe account, you’ll need to set up some rules. Within the deposit settings, choose to set a deposit for the day and time at which you want to take a payment for. e.g. If you’re selling tickets to a dinner, select the start time of the event and make it the same as the end time. Then select the deposit amount in if you require the payment to be completed in advance. And that’s it, done! When customers go to book at this time, they will be asked for full payment and will be automatically sent a payment link or if they book via the widget, they’ll get the chance to pay there and then. If you have any questions about deposits, please email us on help@simpleerb.com or refer to the help guide within your simpleERB account. If you’re looking for an alternative to ResDiary to reduce restaurant no shows, a curse for restaurateurs, here’s how to reduce them to near zero. If a restaurant is working on a small profit margin, a few no shows on a busy night can be the difference between working for nothing and turning a profit. simpleERB has the tools to enable you to reduce the financial cost of your no shows dramatically. You can set any number of these these up to go to customers. e.g. if someone books a long way ahead, one can go a month before their date of arrival and another a couple of days before. They can go by email or sms/text. Diners can be sent sms/text or email reminders of their reservation. You don’t want to be holding people’s credit card numbers in any other form. You would be leaving your self wide open to fraud and even be fined by your bank or credit card company. simpleERB has integrations with Stripe and Paypal to let you do this. Again our integrations with Stripe and Paypal allow you to do this. Hold credit cards in a PCI compliant way. Take deposits. The last thing is, all of these ideas are simple to implement. And quick. 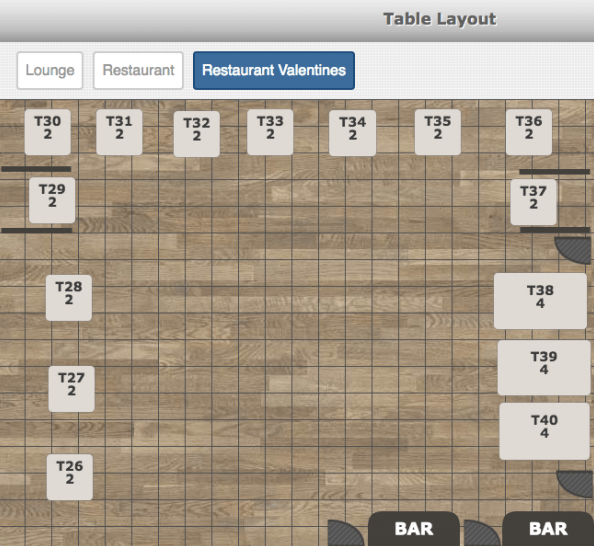 Immediately actionable tactics to help reduce restaurant no shows.